1980 is delivering an abundance of heavy rock albums, with January ushering in hot new product from Aerosmith, UFO and Girl. Another band making a propitious start to the year is the Canadian power-trio Rush, whose eighth Mercury album has just hit the shops. Unlike "A Farewell To Kings" and "Hemispheres", their two previous studio outputs on which long musical epics tended to dominate, Rush have now returned to shorter works. "Permanent Waves" features six cuts, three a side, and it's undeniably their most praiseworthy effort to date. Had they continued to indulge in mammoth tales of black holes in space, as of the "Cygnus X-1" variety, the band may well have reached a stalemate. Happily, "Hemispheres" was the closing chapter of that particular aspect of Rush's musical career. I'm not disputing the quality of such works, merely suggesting that the Rush 18-minute tour de force may have lost the power to dictate. The return to brevity is a particularly wise move, and the new album illuminates their future potential. "Permanent Waves" was recorded at Le Studio in Quebec during September and October of last year, marking the group's decision to work in their native country once again after a spell at Rockfield. It commences with the uptempo "The Spirit Of The Radio" [sic], on which Alex Lifeson plays a mesmerising guitar intro before he's joined by Neil Peart's crashing drums and Geddy Lee's thumping bass. Lee has become quite a focal point on the past few albums, beginning to toy with synthesizers and consequently lifting much of the burden from guitarist Lifeson's shoulders. Nevertheless, it's Alex who dominates the opener with a howling wah-wah break, reminiscent of his killer on "2112". Neil Peart's lyrics have become more complicated but less contrived; thankfully, he's no longer delivering his messages in the guise of a Tolkein fantasy. But what he's writing now seems to imply social comment, and one wonders whether Rush fans understand or care about what he's trying to say. I'm sure that listeners are more responsive to a Lifeson guitar solo than to erudite verse. Geddy Lee's synthesizer is slickly employed during the second number, the lively "Free Will". The mood changes quite radically at the slow, haunting beginning of "Jacob's Ladder". There is some pleasant sustained guitar from Lifeson and, now that the overall sound has been enhanced by Geddy's moog antics, one appreciates Alex's guitar considerably more. In the past much has depended upon his riffs and solos, so now the danger of Rush being branded a riff-band should disappear. The second side is opened by "Entre Nous", where Lee and Lifeson work effectively together. The song flows smoothly, and again Rush must be complimented for their continual efforts to experiment. To brand them merely as a "heavy metal" band is to discount their versatility. The ensuing "Different Strings" is my favourite track because it presents the band in a straightforward acoustic vein, an area in which they score so well. Hitherto, such gems as "Rivendell" and "Tears" have emerged, but neither matches this delight. Hugh Syme, whose name fans will no doubt associate with his artistic cover designs, makes a guest appearance on piano, underlying the tranquil and serene atmosphere set by Geddy's angelic vocals. Lifeson's guitar breaks usually carry more emotion on slower numbers, and here he delivers beautifully controlled lead at the end. "Different Strings" is a Rush classic. Finally, the temptation of a somewhat longer number couldn't be resisted and the band have come up with a 9:27 minute mini-epic entitled "Natural Science". It's divided into three sections, beginning with "Tide Pools", where Geddy's voice mingles agreeably with Alex's acoustic playing. Then, on "Hyperspace", the guitarist switches to electric and the vocal work becomes frantic. 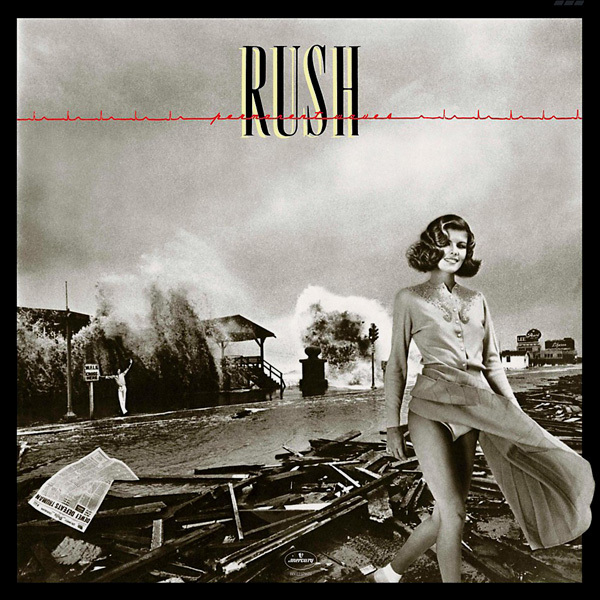 The speed of the song accelerates and a fast pace is maintained throughout the final passage, "Permanent Waves". Terry Brown's production is typically commendable, and he manages to capture the sound of each individual instrument with tremendous feeling. Rush can content themselves in the knowledge that they've once again scored a winner.